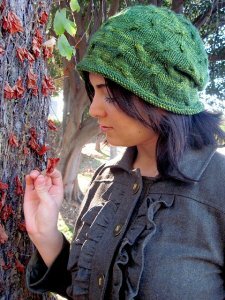 Taken from Grace Akhrem Patterns: "This cute cabled hat is knit in the round and has a slouchy fit." This pattern is from Grace Akhrem Pattern - Tangled Branches Hat. Size US 5 - 16" circular and double point needles (or size needed to obtain gauge), cable needle, and a locking stitch marker are required but not included. Finished Measurements: 24" circ. x 11.5" length after blocking.